Apptimize does A/B testing, feature flagging, phased rollouts, and analytics for native Android and iOS apps. A/B testing is the basis of the systematically improving your app for your users by sending different versions of your app to your real users. What Mobile App Optimization solution do you use? "Super easy, powerful and insightful"
It provides huge flexibility when running multiple experiments, preparing them and previewing them in both development and production environments on iOS and Android. We've released plenty behind feature flags which is really great for us to target and optimize experiences from CRM campaigns, to deep functionality as well as testing new ideas and validating them quickly. The dashboard could do with some work. It would be great to have a quick overview of all my environments so i can see what is happening at a glance rather than have to go into each environment. It's powerful, reliable and most importantly provides valuable insights that are actually actionable. Fantastic service level too. Rapid experimentation and growth hacks are fundamental to the growth of our business. We need to be able to test fast and implement winning experiments or kill failing ones quickly. It's all about cadence and it's allowed us to grow a culture of experimentation and optimisation inside our business. Easy to get set up and use, awesome to be able to create tests without updating the browser (after the initial Apptimize-enabled version is deployed). I wish it had support for A/B tests for our web UI. We ended up subscribing to Optimizely to perform that task. make sure that you have figured out how you want to handle analytics, push notifications, install attribution, and web experiments - there are a lot of vendors with overlapping products in these areas. This has helped us identify the impact of changes we are making to our apps - both to the retention and usage of the apps. It also helps us incrementally roll out new features to ensure that things are working well before all of our users get the new features. Please understand that you bundle a sophisticated engine into your app. This will inflate your APK, perform network communications, and sometimes crash in the ways that are out of your control. The flexibility that this SDK promises may clash with fancy custom widgets that your programmers developed. Note that you cannot use only part of this SDK, it's all or nothing. Even if you only want to get some analytics, or perform demographic A/B test of a text message, you must package full Apptimize with your app, and bear the full consequences. Apptimize is promised to help us separate product decisions from development decisions. Thank you for taking the time to write a review Apptimize on G2 Crowd. Based on your review, we were wondering if you truly meant to give us a 0/5 rating or if it was an accident. If it was accidental, we will be very grateful if you take a moment to update your rating. If it wasn't accidental, please let us know how we can make things better for you. We are a lean marketing team, and we rely a lot on word-of-mouth and referrals from customers to grow. We are always happy to use constructive feedback from users to guide our product roadmap. "Apptimize is used for real-time changes to the our apps behavior, as well as A/B testing features"
The available SDKs for iOS and Android platforms. The real-time changes that we can deploy are acutally limited in the scope - so, not all of our original goals can be met with this tool. Also, we have to plan in advance what sections of parts of our app we would like to change, and only after that we can start using this feature, which means that there is a lag/delay between the time that we want to change something and the time when it actually becomes a reality. For example, with our sprint structure this delay can be as long as 3 - 4 weeks. Our main goal with Apptimize is to tailor our application and its particular modules/features to the precise needs of our users. 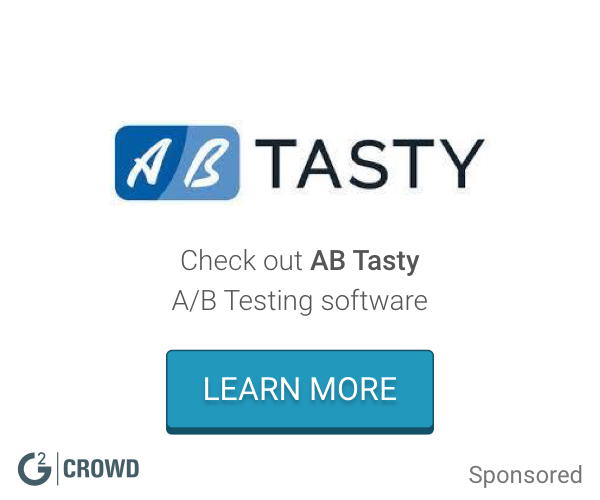 So, far we seen most benefts from the A/B testing. "Apptimize helps us easily a/b test"
It's easy to set up and track tests. The code needed to implement the tests is straightforward. It integrates with Localytics. codeless visual tests have not been useful for us. Testing variations of designs. Testing the impact of changes on conversion and retention. "More than a year an a half using Apptimize for optimize our mobile channel"
Easy to integrate, easy to use. Good customer service. Sometimes the user interface is not the most user friendly as it should be. No sigificant issues. We did have technical trial implimentation issues,but I was happy with how these were handled. Implimenting A/Btesting in our mobile apps in order to innovate quickly. * We monitor all Apptimize reviews to prevent fraudulent reviews and keep review quality high. We do not post reviews by company employees or direct competitors. Validated reviews require the user to submit a screenshot of the product containing their user ID, in order to verify a user is an actual user of the product. Hi there! Are you looking to implement a solution like Apptimize?